As many readers are looking for a reference to calculate land lot area and perimeter with GPS coordinates data (Global Positioning System), so I create an Excel software specifically for that purpose. Download here. Simply by writing longitude and latitude data of each vertex of a land lot, then the program will instantly calculate the area and perimeter. To avoid confusing, always use a clockwise direction to input vertex coordinates of the land lot. Counter clockwise direction will get negative result of area calculation. 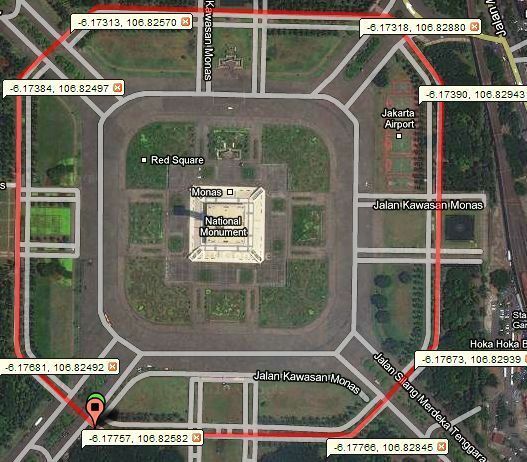 In the picture below, I calculate area and perimeter of an area around National Monument (Monas, Jakarta). Picture shows GPS coordinates obtained from Google Maps. Please note that Google Maps uses latitude-longitude order. Shown in the picture above the land lot is an irregular shaped polygon with 8 vertices (octagon). The starting point is the vertex at bottom left, then this point is also used as an end point to form a closed irregular polygon so that the program can calculate it’s area and perimeter. 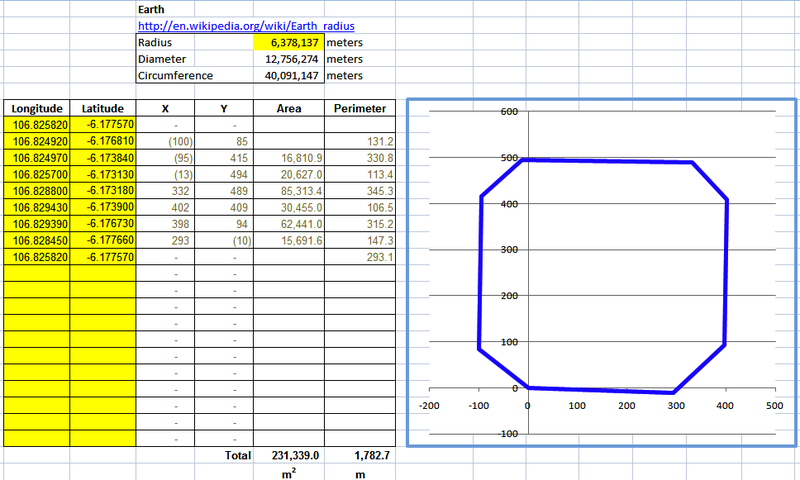 Total 9 GPS coordinates are written, as the starting point and end point at the same vertex. Coordinates are written in yellow cells, and they are sorted in clockwise order. On the right, there is a graph illustrating the measured polygon shape. 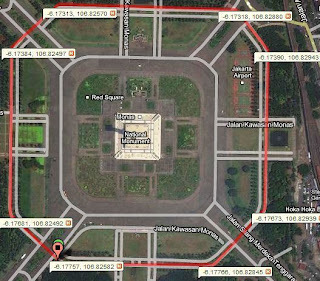 In this example, octagonal polygon area is 231,339 square meters, and the perimeter is 1782.7 meters. In the attached Excel software workbook, there is also formula to convert GPS data with sexagesimal (degrees minutes seconds) format to become decimal format, then that decimal format will be used to calculate the area and perimeter of a land lot with irregular and regular polygon shaped. This article is related to previous articles: calculation of polygons and calculate distance with GPS coordinates. There are two methods for calculation of polygon area, by matrix and by rectangles. Matrix method is rather difficult to understand but the formula is simpler. And there is an article that explain about polygon perimeter calculation. 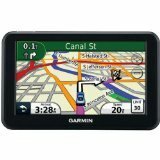 If you are looking for a reliable and high quality GPS equipment such as Garmin, TomTom, Magellan, Midland, Rand McNally, including the popular Garmin GPS 60, vehicle GPS, fleet GPS, please check at GPS online shop "Best Sellers in GPS & Navigation Equipment". You are welcome...I use that spreadsheet to calculate GPS data at field. Once I get data and put it into that spreadsheet, it calculates immediately. No need special application, no need internet connection. Could not download file. Is it still available? I've checked already with different computer and found no problem, the file is still available publicly for download. As that Excel file also contains other GPS calculations such as: heading, bearing, distance, etc; you can download the same Excel file from other articles about GPS in this blog. Please select 'Global Positioning System' label to find more articles about GPS. May be you should open it with Firefox or Google Chrome web browser in your computer. Thank you so much! This is an amazing free tool that made my life so much easier as I was calculating the land size of over 100 farmers in Mali, West Africa! You are welcome, hope the tool will help you to produce more food in the future, and better economy for Mali's farmers. Is the excel sheet still available? I need one to do my field work ..
Hi JD.. just checked, the file is still available for download..
where is this file? the .xls or .xlsx file. The link does not link to an excel file. Sorry..Got the file now but it is not working even in a new version of excel. i think the area is plain area how can i get the actual surface area of land using GPS? 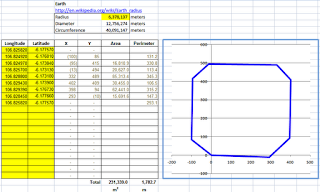 That Excel program has already calculated area on sphere surface, not plain area. If you need to calculate area with texture or with elevation, then you need 3 dimensional calculation. Surveyor softwares can do that, and AutoCad also can do. Im working at several sites in Indonesia. Thanks to your Excel program with English and Bahasa guidance. Myself and my Indonesian crews can calculate and report land lot areas with their smart phones, helped by your Excel spreadsheet. With a very irregular land, is there a limit of lat & lon points (say one hectare) one could enter to determine area? The limit is only Excel row number(65,536 rows), because calculation start on row 10th, so maximum 65,527 points of polygon vertices can be calculated (Latitude and Longitude). Can this program be saved in a laptop computer as an XL file to be accessed manually later where there is no connection to Chrome with WI-FI? You can download and save it in your computer to work offline. Because that Excel file is shared for public. Thank you Heru for your replies. I think if you could provide additional information it would greatly be appreciated - such as step by step instructions on how to insert your file in to XL 2003 users. It is simply using Copy Paste command in Excel, nothing complicated. But maybe your Excel is too old (97-2003?? ), I don't have it anymore. But the file and formula in it was created in 2007 and I was using 2003 Excel. Later I was using newer Excel 2010 to publish it in this article. I think you can Copy Paste those formulas to your Excel, after creating table/chart with the same formatting. Try with a simple square land lot area and perimeter calculation to test your formula, before calculate a more complicated polygon.